A (Shockingly) Short History Of 'Hello' : Krulwich Wonders... Alexander Graham Bell hoped people would answer the phone with the word "ahoy." His rival, Thomas Edison favored another greeting — we all know who prevailed. What do you say when you pick up the phone? You say "hello," of course. What do you say when someone introduces a friend, a relative, anybody at all? Hello has to have been the standard English language greeting since English people began greeting, no? Well, here's a surprise from Ammon Shea, author of The First Telephone Book: Hello is a new word. 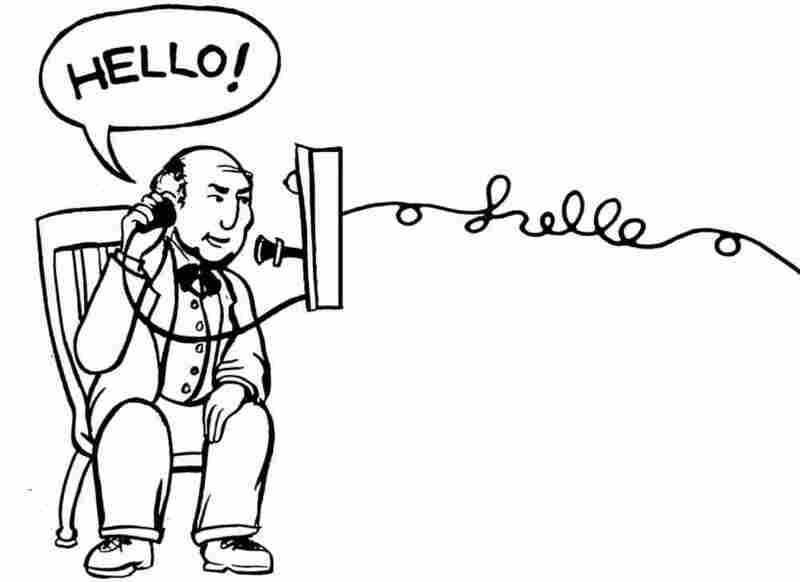 The Oxford English Dictionary says the first published use of "hello" goes back only to 1827. And it wasn't mainly a greeting back then. Ammon says people in the 1830's said hello to attract attention ("Hello, what do you think you're doing? "), or to express surprise ("Hello, what have we here?"). Hello didn't become "hi" until the telephone arrived. The dictionary says it was Thomas Edison who put hello into common usage. He urged the people who used his phone to say "hello" when answering. 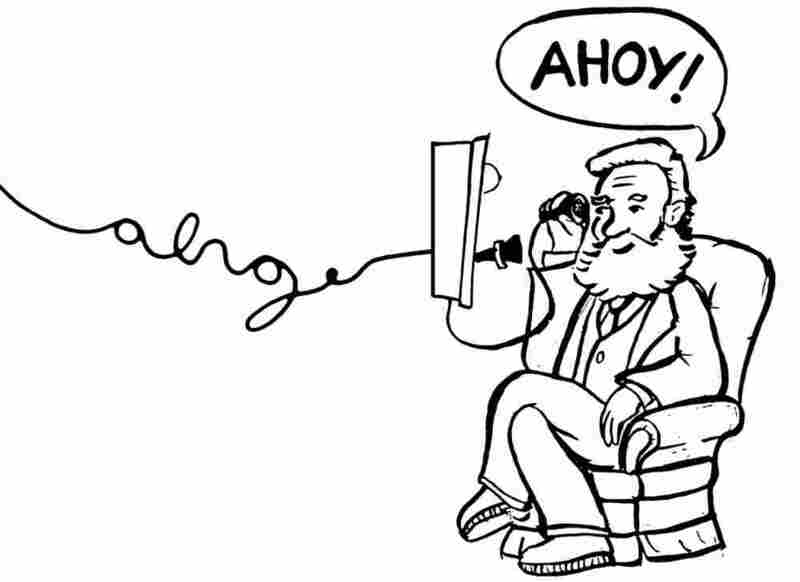 His rival, Alexander Graham Bell, thought the better word was "ahoy." "Ahoy," it turns out, had been around longer — at least 100 years longer — than hello. It too was a greeting, albeit a nautical one, derived from the Dutch "hoi," meaning "hello." Bell felt so strongly about "ahoy" he used it for the rest of his life. And so, by the way, does the entirely fictional "Monty" Burns, evil owner of the Springfield Nuclear Power Plant on The Simpsons. If you watch the program, you may have noticed that Mr. Burns regularly answers his phone "Ahoy-hoy," a coinage the Urban Dictionary says is properly used "to greet or get the attention of small sloop-rigged coasting ship." Mr. Burns, apparently, wasn't told. Why did hello succeed? Aamon points to the telephone book. The first phone books included authoritative How To sections on their first pages and "hello" was frequently the officially sanctioned greeting. Whatever the reason, hello pushed past ahoy and never looked back. 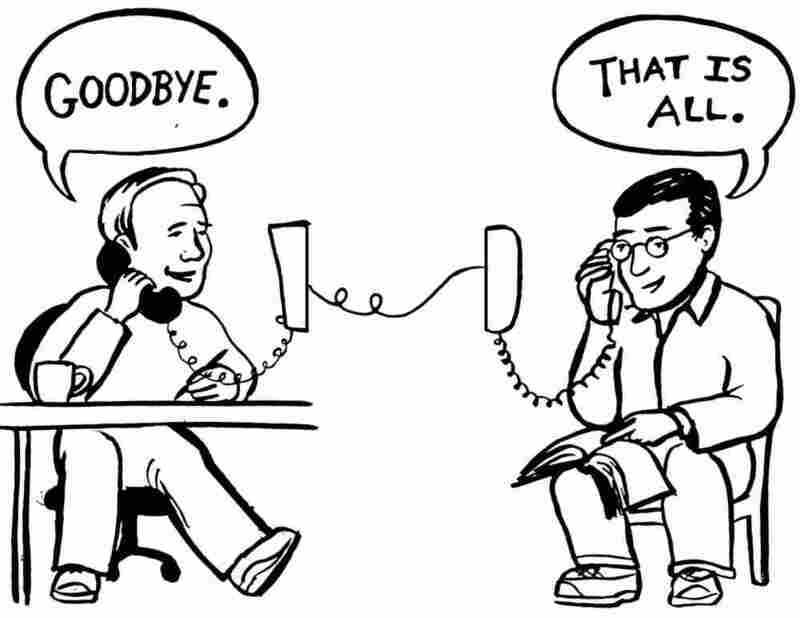 The same cannot be said of the phonebook's recommended Way To End A Phone Conversation. The phonebook recommended: "That is all." The more Ammon thought about it, the more he liked "That is all." ...For several decades the great newscaster Walter Cronkite would end his broadcasts by saying "And that's the way it is," a fine turn of phrase that has almost as much pith and truth to it as "That is all." Broadcast journalist Linda Ellerbee had a similar method of ending her news segments, with the trenchant "And so it goes." These are perfectly serviceable phrases, but even they don't have the clarity and utility of "That is all." I should like to see "That is all" make a comeback in colloquial speech, and I have resolved to attempt to adopt it in the few telephone conversations that I engage in. Ammon Shea's new book (Perigee/Penguin 2010) is called The Phone Book: The Curious History of the Book That Everybody Uses But No One Reads. Our illustrations come from the magical pen of Adam Cole, intern with NPR's Science Desk, and should anyone wish to place a call to "Monty" Burns in Springfield, be prepared. This is how he will answer the phone.